It may be a fun fall sport for players of all ages, but there are many hazards in football that athletes need to be aware of so they can play safely. Football can be a fun team sport that has many benefits, including fostering physical fitness, hand-eye coordination, problem solving and strategy skills, team cooperation and good sportsmanship. Typically played from August through November in youth, school and adult leagues, football can keep players fit and healthy, but only if they avoid the inherent dangers of this high contact sport. Football has several types of hazards, from physical injuries to academic and financial repercussions. By understanding how hazards can occur and how to minimize risks, players can enjoy the fun of this autumn sport without danger. Injuries - broken bones, strained muscles, cramps, twisted ankles, sunburn, eye strain, etc. - are the most common hazards in football because it is a highly active, high contact sport. Minor injuries may just be a temporary inconvenience, but severe injuries can end a player's athletic career and cause ongoing pain and disability. With basic precautions and careful play, however, the risk of injuries can be greatly reduced. Wear proper equipment, including pads and helmets, to avoid major injuries. All equipment should fit properly and snugly without restricting circulation or movement. Opt for a safe play options such as no-tackle or flag football to avoid injuries from rough contact, particularly during practices. Practice good sportsmanship while playing to avoid inadvertent injuries. Always warm up and stretch properly before playing to avoid muscle strains and cramps. Be aware of your physical limits and do not continue playing when short of breath, unusually fatigued or otherwise worn out. Wear proper sports goggles or a helmet visor while playing to prevent dust and dirt from entering the eyes as well as to limit the eyes' exposure to ultraviolet radiation. Wear long sleeves and long pants to minimize your skin's exposure to too much sun, and wear high SPF sunscreen on your face, neck, hands and other exposed skin. Choose good athletic shoes with adequate support for running and turning on potentially uneven ground. Inspect the field before playing to remove rocks, fill potholes and eliminate other obstacles. As temperatures drop during the autumn months, football players may find themselves playing long games in frigid weather and even in rain, sleet or snow. Becoming chilled without adequate protection can result in harsh colds and other illnesses that can keep a player off the field and miserable for weeks. Fortunately, there are several strategies that can keep players out of the doctor's office for the season. Cover the bench with blankets and other warm materials to avoid sitting on cold metal when not playing. Wear appropriate clothing for the weather conditions as much as possible, including coats and gloves. Keep dry socks, shoes and other gear available to change if the weather clears. Drink warm liquids to help boost body temperature and prevent chills. Get plenty of rest and eat a healthy diet that includes plenty of vitamin C and a regular multivitamin to boost the immune system during football season. Football players are often encouraged to gain a few pounds to add extra bulk to the lineup, but this can quickly lead to excess fat and the danger of obesity, which in turn can lead to a range of health problems such as heart disease, diabetes, arthritis and more. 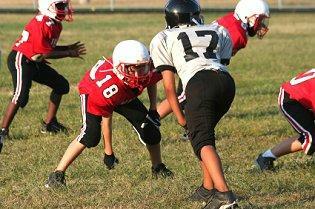 Changing attitudes about what is appropriate football weight gain, however, can minimize the risk of obesity. Concentrate on weightlifting and building dense, heavy muscle rather than simply adding fat bulk to gain weight. Practice valuable skills such as sprinting, passing, catching and dodging rather than relying on bulk to create a winning play. Spectators are also at risk for football obesity - limit tailgating parties and choose healthier foods instead of fast food or sugary snacks to avoid sideline pounds. Student athletes may get wrapped up in practices, games, pep rallies and celebratory parties during football season, which can quickly lead to falling grades. Many schools have academic probation policies and athletes who find their grades sinking will be sitting on the bench instead of playing if they do not improve their academic standings. Careful planning before that failing grade, however, can keep student athletes at the top of their game both in class and on the field. Avoid becoming involved in too many extracurricular activities that will take away valuable study time. Adjust a fall class schedule to include easier classes if possible and save more difficult subjects for after football season. Ask teachers for extra help if needed to understand class material. Schedule a study hall period during football season to allow more time for completing assignments. Complete missed assignments right away to avoid unnecessary late penalties and lower grades. Find a tutor for difficult subjects if needed. One of the little known hazards of football is financial loss. Parents may invest hundreds of dollars in new equipment, transportation to distant games, player awards, game tickets and other costly needs before the season ends, but some careful planning can avoid these financial fumbles. Begin scheduling team fundraisers long before football season starts. Investigate securing team sponsors from local businesses willing to buy equipment in exchange for advertising in the stadium, on uniforms, or in announcements. Choose used equipment for practices rather than spending more money on new supplies. Encourage players to treat equipment respectfully so it will last longer than a single season. There are many hazards in football that players, spectators and parents need to avoid, but some common sense and careful planning can keep difficulties out of the end zone.